I am trying to understand how the whole ecosystem of iOS works. Until now, I could find an answer for most of my question (and trust me, there have been a lots of them), but for this one, there seems to be no clear answer yet. What is the difference between XcodeProject and XcodeWorkspace files? Which one of them should I work with when I'm developing my Apps in team/alone? Is there anything else I should be aware of in matter of these two files? I think there are three key items you need to understand regarding project structure: Targets, projects, and workspaces. Targets specify in detail how a product/binary (i.e., an application or library) is built. They include build settings, such as compiler and linker flags, and they define which files (source code and resources) actually belong to a product. When you build/run, you always select one specific target. In Xcode, you always open projects (or workspaces, but not targets), and all the targets it contains can be built/run, but there’s no way/definition of building a project, so every project needs at least one target in order to be more than just a collection of files and settings. In a lot of cases, projects are all you need. If you have a dependency that you build from source, you can embed it as a subproject. Subprojects can be opened separately or within their super project. If, however, your library (the subproject) is used by a variety of other projects (or their targets, to be precise), it makes sense to put it on the same hierarchy level – that’s what workspaces are for. Workspaces contain and manage projects, and all the projects it includes directly (i.e., not their subprojects) are on the same level and their targets can depend on each other (projects’ targets can depend on subprojects’ targets, but not vice versa). 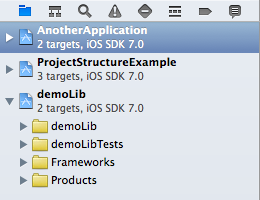 In this example, both apps (AnotherApplication / ProjectStructureExample) can reference the demoLib project’s targets. This would also be possible by including the demoLib project in both other projects as a subproject (which is a reference only, so no duplication necessary), but if you have lots of cross-dependencies, workspaces make more sense. If you open a workspace, you can choose from all projects’ targets when building/running. You can still open your project files separately, but it is likely their targets won’t build because Xcode cannot resolve the dependencies unless you open the workspace file. Workspaces give you the same benefit as subprojects: Once a dependency changes, Xcode will rebuild it to make sure it’s up-to-date (although I have had some issues with that, it doesn’t seem to work reliably). 1) Projects contain files (code/resouces), settings, and targets that build products from those files and settings. Workspaces contain projects which can reference each other. 2) Both are responsible for structuring your overall project, but on different levels. 3) I think projects are sufficient in most cases. Don’t use workspaces unless there’s a specific reason. Plus, you can always embed your project in a workspace later. 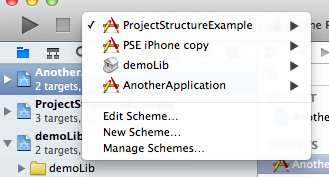 There’s one remark for 3): CocoaPods, which automatically handles 3rd party libraries for you, uses workspaces. Therefore, you have to use them, too, when you use CocoaPods (which a lot of people do). A workspace is a collection of projects. It's useful to organize your projects when there's correlation between them (e.g. : Project A includes a library, that is provided as a project itself as project B. When you build the workspace project B is compiled and linked in project A). It's common to use a workspace in the popular CocoaPods. When you install your pods, they are placed inside a workspace, that holds your project and the pod libraries. When I used CocoaPods to develop iOS projects,there is a .xcworkspace file,you need to open the project with .xcworkspace file related with CocoaPods. But when you Show Package Contents with .xcworkspace file,you will find the contents.xcworkspacedata file. The .xcworkspace file has reference with the .xcodeproj file. 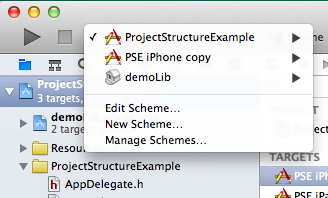 how to integrate two project in xcode? Is there any equivalent of a gradle module on an iOS project? How to keep project available after changing the location of imported project?